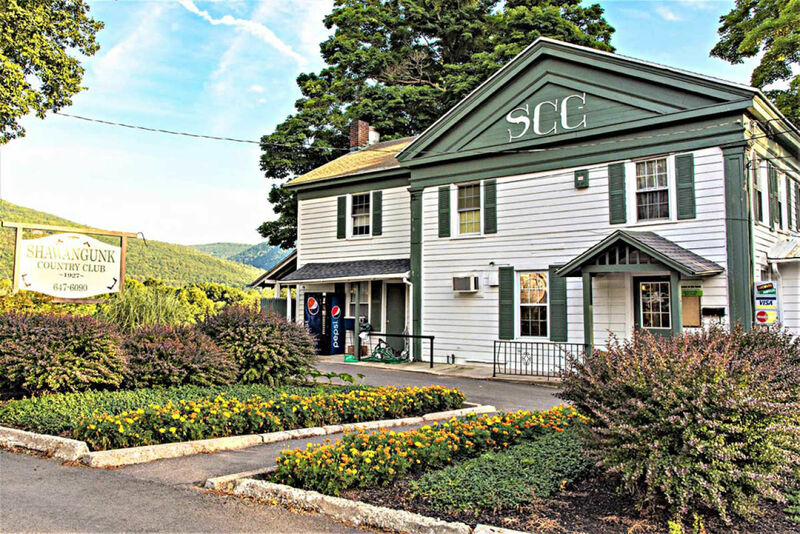 ELLENVILLE – The possible sale to a developer of the Shawangunk Country Club & Golf Course, situated on the southern edge of the Village of Ellenville, has produced a quick reaction in the village and town. The Mayor of Ellenville, Jeff Kaplan, immediately moved to have the village itself buy the property and retain it as an open space. There will be a public hearing on the scheme at the Village Board of Trustees meeting on March 11 at 6 p.m. at the Village Hall, 2 Elting Court. The price quoted was $475,000. That money would be taken from the "Mountain Money" fund that the village created when it sold the Ellenville tract of land on the Shawangunk Ridge to the Open Space Institute in the late 1990’s. In order to use the "Mountain Money" the Village must get approval from residents via a mandatory referendum. That will be held six weeks after the public hearing is closed. If that happens on March 11 than the referendum would take place during the week of April 22. The property, consisting of 48 acres, was once farmland, but was turned into a country club with a golf course in 1927. It remains the largest single stretch of open space in the village, on a par (sic) with the school district ball fields at the northern end. Unfortunately, in the modern era, people have less free time and less time to play golf. This trend has been noticeable throughout our area, putting golf courses under financial pressure. Ultimately that led to the Shawangunk Country Club and Golf Course deciding to put itself up for sale. The beloved "Gunk", with its attached restaurant, was part of the social fabric of the area and so the decision was not welcome. An initial bidder withdrew after a short period of interest, and the club was forced to consider accepting the bid from Jonah Mandelbaum, a well-known developer who has built many senior housing complexes in the region, including the one beside Ellenville Regional Hospital. Mandelbaum’s plan was for a mix of senior housing and "work force" housing, which would be subsidized and "affordable." The style of these buildings is now well-established across the country, two and three stories, with styled facades and sloped roofs, they are designed to be innocuous and pass unnoticed. Usually they are in places where they can accomplish that goal. However, the country club property is not one of those. Mayor Kaplan voiced the concerns of many Ellenville residents when he noted that the village has more than enough rental housing already. He also noted that retaining a golf course would be worthwhile in attracting people to move to the village. Neighbors of the golf course tended to agree with the Mayor. Tony Guiliano, who lives just across the road, said, "It’s a great amenity for the village and it should remain a golf course." Thinking about the cost of operating it, Guiliano said, "Sometimes you have to channel money to keep things that are important." Guiliano also observed that "we have golf on the curriculum at our schools, so it ties right in with that." Another long-time neighbor, Wallace Stone, who lives right on the southern boundary of the golf course said, "I would much rather it stay as a golf course." The village board met with the Town of Wawarsing board last Thursday to feel out the town’s thoughts. Mayor Kaplan reported, "It was a good meeting, the town is on board and we feel that the community supports the idea of buying the property." Terry Houck, Town Supervisor for Wawarsing, said, "The town board is optimistic about the effort to secure the golf course property, but is also aware of the continuing costs that will need to be met for maintenance, and staff. And that means also aware of the budgetary constraints." Lisa Wiles, Superintendent of Schools for the Ellenville Central School District, said that the district will continue to use the golf course. "We would continue to use the local course for our golf teams and we would pay to use it, of course." For a reality check, it should be noted that the Village zoning laws do not provide any impediment to a developer seeking to build senior housing. The village zoning in section 227-25-2 states: "The Village Board recognizes that there is a community need to provide housing facilities for senior citizens who do not need skilled nursing care and who are capable of providing for their ordinary, routine necessities of life. It is the intent of this section to encourage the development of moderately priced multiple-dwelling units for senior citizens, to ensure that such developments provide the basic services and facilities to accommodate residents’ needs and to minimize detrimental effects on neighboring properties." Village Code Enforcement Officer Brian Schug said, "If an application conforms to our zoning rules, then there would be a relatively smooth path to a permit. Today, State Environmental Quality Review rules (SEQR) are the biggest barrier to development. However, that property has little in the way of wetlands or other SEQR issues." Indeed, on the Village Comprehensive Plan map of flood plains, the golf course property’s south eastern corner barely grazes the flood plain along the Sandburg Creek. Schug explained that a developer would not require either variances or a special use permit to build residential buildings on the site. Make sure you head out to the public hearing at the village hall on March 11 at 6 p.m., to listen in and add your opinion to the conversation. We’ll see you there!